KIWI AS: Loved by Kiwis, these little green beauties make the best cakes, muffins, vodka, anything really. It's that time of year when plastic bags of feijoas sit on kitchen tables, overflowing with generosity of your family or neighbours who are blessed to have a feijoa tree in the back yard. But with the bounty of feijoas bestowed up the Waikato at this time of year comes the age old question: what on earth to do with them all? 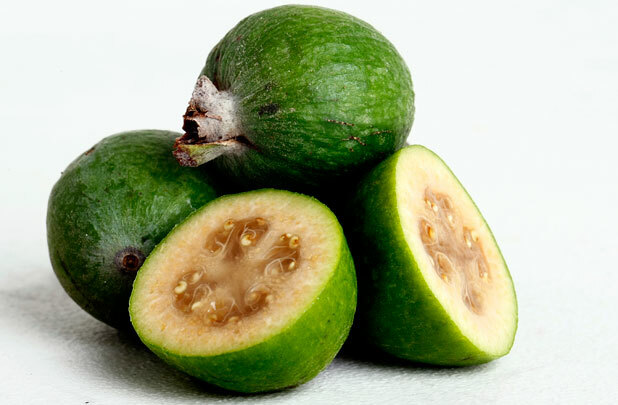 We asked and in between mouthfuls of feijoa you answered. Here are your favourite recipes. Enjoy. - Lightly oil or spray a 20cm ring tin. Line the bottom of the tin with strips of baking paper. Heat the oven to 180C. - Peel ripe feijoas (depending on size I used 8 egg-sized feijoas) with a sharp knife. Slice each feijoa in half lengthwise, then slice thinly. - Measure 1 1/2cups of the sliced fruit and place in a bowl with 2 tbsp brown sugar and the first 1/2 tsp cinnamon. - Cream the softened butter and caster sugar in a small bowl with an electric beater. - Beat in the eggs one after the other, then transfer the mixture to a large bowl. - Stir in the prepared feijoas, sifted flour, baking soda, cocoa, second measure of cinnamon and the nutmeg alternately with the sour cream in two batches. - Transfer the batter into the prepared pan and smooth the top evenly. - Bake at 180C for 45-50 minutes, or until a skewer exits cleanly from the middle of the cake. - Allow to sit for 5 minutes, then turn out onto a wire rack and remove the baking paper. Allow to cool completely. - Cover the top and sides with the chocolate glaze. Place in a small microwave proof bowl and heat on 50 per cent power for about 1 minute. Whip with a knife until smooth and shiny. Beat 50grams melted butter and 1 egg together. Add to 1 cup of flour, 1/2 cup sugar, 1 teaspoon Baking Powder, pinch of salt and 1 cup of combined Feijoa & Grated Apple. Bake for 15mins at 180 degrees. Put all ingredients into a saucepan bring to the boil, simmer for approx 1.5 hours. Stirring often. Pour into sterilised jars. Bring two cups rose wine and a half cup of sugar to boil, simmer 3-4 mins. Add a dozen or so peeled and halved feijoas and poach for about 10 mins until tender. Serve with lashings of whipped cream! Yum! For every 1.5kg of peeled feijoas you need 1.25kg sugar and the juice of two lemons. Peel, weigh and chop the fruit, dropping pieces into water acidulated by a jot of cider vinegar. Put prepared fruit in saucepan with lemon juice and cook gently until feijoas are tender. Add sugar and stir to dissolve, then boil until setting is reached. Decant into warm sterilised jars, cover to seal while hot. Cut the feijoa in half and scoop flesh into blender. Whizz for a few seconds then add other ingredients and blend about 30 seconds until frothy. - Rub pork chops with olive oil and fry in a heavy-based pan for 5 minutes either side. - Set the meat aside to rest. - Add thick, peeled feijoa slices to the pan juices and fry 3 minutes, turning once. - Arrange feijoas over the chops, serve with green beans or salad. Optional sauce: add cup green ginger wine or ginger beer to the pan with the feijoa slices and stir in cup fresh or sour cream. - Peel feijoas leaving flower end intact. - Cut across bottom so fruit sits upright in pot. -Mix all remaining ingredients together and pour over the fruit. - Bring to boil and simmer gently for 10 minutes or until fruit softens. - Remove fruit and set aside with half of the poaching syrup. - Continue to simmer the remaining syrup until is has reduced by half and thickened. - Serve the poached feijoas alongside french toast and crispy bacon (for brunch dish) with a small dish of the reduced syrup. For desert, serve solo with cream or yoghurt. Serves four. - Boil the water and sugar together for 5 minutes. - Add the lemon juice and pulped feijoas. - Pour into a tray suitable for freezing and freeze until firm. - Turn into chilled bowl and beat until light, working quickly to avoid melting. - Return to freezer without stirring and leave until very firm. - Serve in chilled individual dishes.